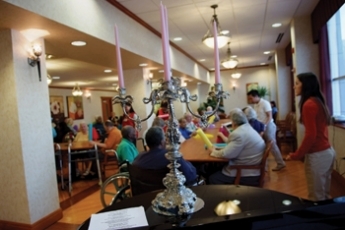 The Carlton at the Lake is one of Chicago's highest-rated nursing homes. Only 14 nursing homes of the city's 92 Medicaid certified homes received the federal government's highest quality rating. Photo by Joe Gallo. Carolyn is in her 70s and lives in a nursing home. Her closest relative was a cousin with Down’s syndrome, but he died and she now describes herself as the “last of the Mohicans.” She looks forward to lunches with friends from outside the nursing home and, knocking on wood, credits her good health to a strictly vegetarian diet, which is prepared for her at the nursing home. Still, there was a time when Carolyn, whose last name has been omitted at the request of the nursing home to protect her identity, ran the show. She managed retail stores for the Joseph Magnum Corp. and lived in California, New York and Maryland before returning home to Chicago to run the family business and care for her cousin. She hasn’t forgotten what it was like to be in charge and what a well-run organization looks like. Carolyn is at The Carlton at the Lake, one of only 14 out of Chicago’s 92 Medicaid-certified nursing homes in Nursing Home Compare that received the federal government’s highest rating. Part of The Carlton’s success, said Rose Marie Betz, administrator, is the long tenure of the staff and “permanent assignment” to residents. “When you have a constant rotation, a revolving door, you can’t build a basis of care,” Betz said. Experts agree, citing low turnover and permanent assignments as some of the key qualities of a good nursing home. “When staff are assigned to the same residents, they get to know them. They get to know people who have particular behaviors. Behaviors in nursing home residents are an attempt to communicate something,” said Catherine Hawes, regents professor of health policy and management at the School of Rural Public Health at Texas A&M Health Science Center. Experts also point to staff job satisfaction and support as indicators of a highquality nursing home. “Look at whether the [human resources] department really tries to solve problems of the staff,” said Barbara Bowers, director of the Center for Excellence in Long-Term Care, and professor at the School of Nursing, at the University of Wisconsin at Madison. When Virginia Webb, minimum data set coordinator who has worked at The Carlton for 12 years, was forced to take six weeks off for emergency spinal surgery in 2002 and another two and a half months on an adjusted schedule because of difficulties getting to work, she said her supervisors and Betz worked with her schedule. “If I say I’m going to have to go to the doctor at 1 [p.m.],’ they say –˜OK.’ Ms. Betz takes care of her staff. Not just me. She does it for everybody,” Webb said. Another aspect of staffing that is important in providing quality care in a nursing home is staffing levels, according to experts. At The Carlton, residents are placed on floors based on level of acuity and the floors are staffed accordingly, with a social worker on each floor as well. “On a highly skilled floor, we have more staffing, more nurses,” Betz said. Charlene Harrington, a professor of sociology and nursing at the University of California at San Francisco, said that people should not be fooled by a beautiful lobby, but should focus on staff levels and quality of care. “They think if they look fancy, they are going to be good. That is just not the case. There are some older homes that put their money into the care,” Harrington said. The Carlton has some notable qualities beyond its decorated lobby that experts say point to a better quality nursing home. It is quiet and odorless. There are decorations on the residents’ doors and in the activity rooms. The dining room has white tablecloths with white cloth napkins and flower centerpieces, as a well as a grand piano. It appears clean. Residents are also actively engaged, another important factor experts point to in a quality nursing home. “Do the residents talk to each other? Are they engaged in activities and not just lined up in the hallway?” Bowers said. On a recent visit to The Carlton, a group of residents waited in an activity room for group exercises and to listen to the radio. Cooking classes, bocce ball, movie matinees and card games are some of the activities listed each day on the calendar for residents, as well as outings to museums, shopping and lunch. There is an on-site chapel where Mass is held each Tuesday, as well as a beauty salon and an outdoor patio with a barbecue. “People are living there,” Hawes said. Now residents are golfing, bowling and playing tennis. Not literally, but with the help of the Wii video gaming system. It is one of the newest programs being added. “It is very good for hand and motion coordination. It will be set up in the lounge, and we will select a few residents to be trained and then they’ll help other residents,” said Activities Director Israel Fernandes.